Samsung Galaxy S10: If you could remember Anatel revealed the Galaxy S9 and S9+ battery capacities even before the launch and the report turned out to be true. This time also, it has published an article specifying the certifications of the batteries for the upcoming Galaxy 10. But, everything doesn’t seem right. In its report, Anatel has listed all three models, i.e., EB-BG970ABU, EB-BG973ABU and EB-BG975ABU. They are actually the Galaxy S10 Lite, S10, and S10+ respectively. The common thing between all the three smartphone models is that they are said to house 3000mAh battery. It seems that the rumors that we have heard are going to be true about the S10 Lite. Earlier, it was rumored to have a battery capacity of 3100mAh. The 100mAh difference may have been due to the distinction between the minimal and typical capacity. But, what doesn’t feel good is that the middle versions – the Galaxy S10 was supposed to sport a 3500 mAh battery and the biggest of all three – the S10+ a 4000mAh battery. It is unfortunate that we could gather the exact and real information about the same. Korean agency did certify the Galaxy S10+ battery and posted an image, but it didn’t have the complete information. It’s because the mAh and Wh ratings weren’t published. Only “TBD” was written against them. We have attached the same picture, but it’s hard to see. 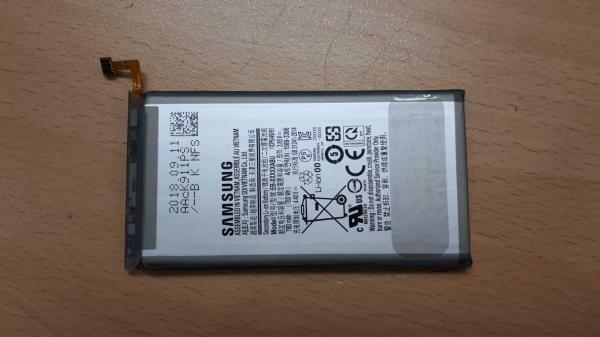 However, you can compare this photo of the S10 Lite battery. It also reads ‘TBD’. We hope that Anatel certificates turn out to be wrong and the upcoming smartphone in the Galaxy S series should come out with a bigger battery. But, there is no way to confirm it for now.